A chocolate and nut packed cookie with a wheat flavored base. These are made with Hodgson Mill brand graham flour. 2/3 cup (3.1 ounces) Hodgson Mill Whole Wheat Flour or "Graham Flour"
Don't preheat the oven quite yet because this dough is better after it's been chilled. You can bake it right away, but the cookies spread a bit more. In a large mixing bowl, beat the butter with an electric mixer on medium speed. Beat in both sugars until well mixed. Scrape sides of bowl and beat in the egg and vanilla. When egg is blended, beat in the baking powder, baking soda, and salt. By hand, stir in the flour. 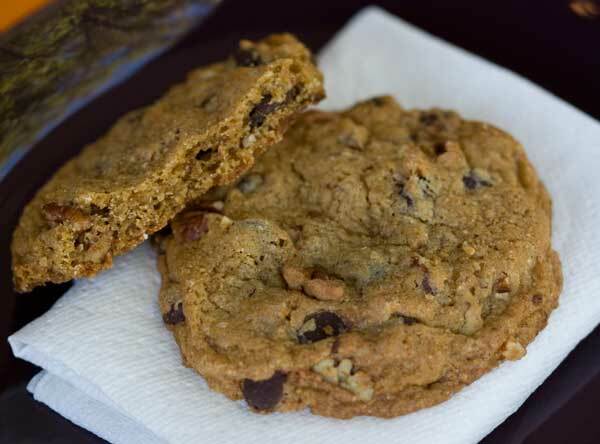 When flour is incorporated, stir in the chocolate chips, Heath Bars (if using) and toasted nuts. Using a generously heaping tablespoon, scoop up large mounds and arrange them on a foil lined plate. Cover with plastic wrap and chill for 8 hours or overnight. Preheat oven to 350 degrees F. Line two baking sheets with regular (as opposed to nonstick or parchment) foil. Arrange mounds of dough about 3 inches apart on baking sheets. Press tops down slightly to level with the edges. Let cookies cool on baking sheet for about 4 minutes, then transfer to a wire rack to cool completely. For smaller cookies, make 18 to 24, press down slightly, and bake for about 12 minutes. I made mine rather large and was getting from 12 to 16 cookies in each batch. It was precise because I kept playing with the amount of chocolate and nuts. Also, this dough does not have to be chilled, but you might notice a better flavor if you let the dough sit overnight. It definitely helps them spread less. To toast the pecans or walnuts, lay them on a baking sheet and bake at 350 for about 6 to 8 minutes or until they start to release their oil. Also, I've mentioned brand names because Hodgson Mill sometimes seems a little more wheat-y tasting. As for the salt, different brands have different size crystals even when they all say "coarse". Morton Kosher salt says it measures like table salt, while some other brands of salt have much larger crystals which means you'll need to use more to get the same flavor. I stick with Morton because it can be used interchangeably with recipes that call for table salt.